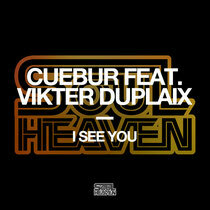 Moving dancefloors since the age of 15, South African DJ/producer, Cuebur, teams up with singer Vikter Duplaix to release ‘I See You’ on the very cool Soul Heaven label. Without a doubt the biggest asset in ‘I See You’ are the silky Casanova vocals by Duplaix, which make slow nods to the bedroom and ‘90s R&B. The original mix explores the tender side of house music, interweaving pillowy 808 toms with dim lit synth stabs, while the energetic remix by Andre Lodemann displays the producer’s abilities to create potentially dazzling dancefloor music. Together the two versions are likely to shift the spotlight towards Cuebur and the South African house movement within the international dance music scene, which can only be a positive. Check it out below, it’s out 28 April.